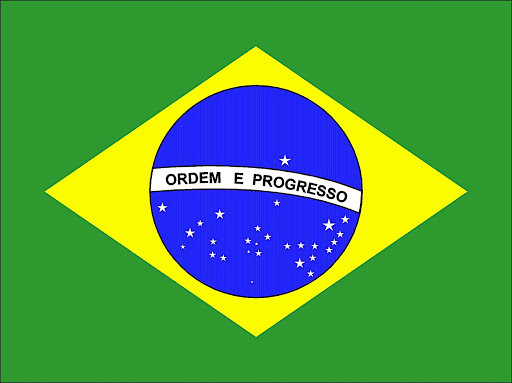 The flag of Brazil adopted May 1992. Brazil, host of the 2014 FIFA World Cup, is a South American country known for its rich festivals, cultural diversity, and ties to Portugal. With an area that covers almost half of the continent, Brazil is South America’s largest country and home to the largest rainforest in the world. Aside geographic recognition, Brazil also holds the number one spot in terms of economic power, top universities, and the murder rate of journalists in South America. Brazil fell nine places to 108th on the 2013 World Press Freedom Index, after falling 41 places in 2011, which Reporters Without Borders attributes to the country’s “badly distorted media landscape” and violence against journalists. Reporters Without Borders also listed Brazil as South America’s deadliest country for media personnel in 2013, due to the unsolved murders of five journalists. By March of 2014, four journalists in Brazil were murdered, indicating an increase in violence against journalists in the country, a trend that is not surprising when placed in the context of Brazil’s violent history. Brazil is the only Portuguese-speaking country in South America, with its roots dating back to 1549 when it was first colonized by Portugal. In 1888, Brazil was the last country in the world to abolish slavery, just a year before the Portuguese monarchy was overthrown. The first federal republic established after the monarchy was replaced by a dictatorship in 1930, known as the Estado Novo or Vargas Era. The Estado Novo government was led by Getulio Vargas until his suicide in 1954 before falling under military rule until 1985. This restricted right to free speech was made more restrictive in 1967, when article 151 was added to the constitution, making “undermining the democratic order” an offense punishable by “the suspension of [free speech] rights…for a period of two to ten years.” It was during this period when several laws were passed that systematically and unconstitutionally restricted the rights of citizens until Brazil became a democracy in 1985. Brazil has remained a democracy ever since, and in 2011 Brazil elected Dilma Rousseff, the country’s first woman president. Despite this improvement from the constitution of 1967, Brazil’s judicial system continually restricts the speech of its citizens; a tradition with which the country is all too familiar. Historically, free speech in Brazil has never been more restricted than it was during the military regime, which lasted from 1964-1985. Aside adding article 151 to the constitution, various laws were passed limiting the liberties of citizens, the most restrictive being the National Security Law of 1953 and the Institutional Acts of 1964. The National Security Law redefined crimes against the state, and banned any political organizations that conflicted with the values of the military regime. Citizens could be indicted for being a “threat” to national security, citizens who witnessed “threatening” acts without denouncing them could also be punished under the new law. Under the Institutional Acts, one could be tried without knowing their action was illegal. The Institutional Acts (AI) were enforced by the military as an effort to lead the country toward a better democracy, while methodically violating the constitutional rights of its citizens. The exact number of constitutional violations under these laws during the military regime went unknown until 1979, when a group of religious officials and citizens rented three Xerox machines and spent over 6 years copying 707 lawsuits against civilians, totaling over a million paper copies and 543 rolls of microfilm. The results of this endeavor, the Nunca Mais project, paint a grim picture of how free speech was suppressed under these laws. From 1964-1974 over 4,841 people were sanctioned under AI-5, and the great majority lost their political rights. Torture in Brazil, which recounts political crimes during the military regime, notes actions that were “construed as crimes under national security” were actually “the exercise of freedom of thought and opinion.” Regardless of their constitutionally protected nature, expressive speech made up 12.7% of all charges during the military period-more than charges for violent actions- while the possession of subversive material made up 5.9% of all charges. Nunca Mais also found that of the 4,476 whose level of education was indicated in military court proceedings, 2,491 had a university degree, and a mere 91 declared themselves illiterate. This is remarkable given a mere 1% of the population in Brazil was educated at the collegiate level, while over 20 million adults in Brazil were classified as illiterate. This indicates the military regime had a special interest in silencing the middle class, who they believed were more threatening than the uneducated. The regime’s agenda became evident shortly before the declaration of AI-5, when dormitories at the University of Sao Paulo were invaded by military troops who arrested students and confiscating personal belongings they deemed “subversive.” This event foreshadowed judicial decisions to come for college students who acted in any way that was considered subversive. In 1970, with the aid of the Decree-Law of 1967, prosecutors charged four female students from the University of Sao Paulo with the possession of subversive propaganda. Law enforcement found over 2,000 pamphlets in their possession that stated “down with the dictatorship,” and “the united people will overthrow the dictatorship.” Despite insufficient evidence connecting the women to the Communist movement, the military court sentenced each of them to six months in prison. On appeal, the sentence was upheld. In 1969, Alberto Rocha, a 22 year old student, was convicted for subversive material after turning in a term paper that praised agricultural policies in Communist China. Prosecutors found the paper to be subversive propaganda on the grounds that it “defamed public officials” and “advocated violence” between the classes. On 4 August, 1970, Rocha was sentenced to one year in prison. The military court later reversed the decision after public outcry on Rocha’s behalf. Sociology student Vinicius Brandt’s served three years in prison after being arrested in 1971 for being a member of a banned political party. Brandt testified that after his arrest he was taken to a “military-police facility” where he was stripped, beaten, and “burned with cigarettes and lit paper.” The military court, indifferent to Brandt’s testimony, charged him the maximum sentence of five years and revoked his political rights for the following decade. Brandt’s lawyer appealed the decision, and his sentence was reduced to 3 years. The Supreme Court upheld the decision on the grounds that his allegations of torture were fabricated. Though the beginning of democracy marked an end to government sponsored free-speech torture, Brazil has yet to live up to the standards set by its constitution. In October 2006, Emir Sader, a professor, was sentenced to a year in prison due to an article published in May of 2005 that accused a senator of being an elitist and a racist. Alongside the conviction, Sader lost his position at the Federal University of Rio de Janeiro. The defamation suit filed against Sader was based on the Press Law passed in 1967, which placed harsh punishment on anyone accused of libel or defamation. Sader was able to get his sentence reduced to community service, however he did not return to his position at the university. In 2009, 33-year-old journalism student Emilio Neto was ordered to pay US $9,200 in “moral damages” to a school director due to a comment posted by someone else on his blog. The “damaging” comment was posted by an anonymous blogger who insulted the director of a private school, nun Eulalia Lima. Neto is in the process of appealing. In July 2012, journalist Jose Goes was convicted in a defamation case and sentenced to seven months and 16 days in prison. Goes was convicted due to a fictional story posted on his personal blog that poked fun at political corruption. The story, which was told in first person with characters whose names were made up, offended judge Edson Ulisses, who claimed the story defamed both him and his brother. Goes plans to appeal the verdict, arguing that his freedoms have been violated. Currently, the world’s eyes are on Brazil as the 2014 World Cup nears. The country has recently come under scrutiny after it was revealed that Brazil plans to monitor citizens’ social media during the World Cup and remove content that is “distorted” or “misleading” for the “safety of the event.” Free speech advocates, however, disagree, asserting that the Brazilian government “directly attacks the freedom of expression” and “makes room for censorship.” The Index on Censorship also notes that this issue is not being addressed by the Brazilian press, which could be expected given the history of the press in Brazil and its relationship to the state. Brazil has been censored since the state’s first use of the press. In 1808, Portugal brought the first press to Brazil after fleeing Napoleon’s forces, and with it the first set of press restrictions. Statements contradictory to good morals were prohibited, as well as expressions of government dissatisfaction. The monarchy censored the colonists in order to protect people they felt were ignorant, a sentiment that was echoed centuries later. In fact, the biggest reason freedom of the press is not heavily debated in Brazil is lack of precedence. The state has always been involved with the press, and the relationship is a delicate one; that is, the press cannot survive without the government. This is due to a combination of factors, including the low readership of Brazilian newspapers, a dependency on advertising, and government financing. Brazil’s low readership has a direct effect on the relationship newspapers have with the state. Low readership rates yield low sales, meaning a newspaper’s survival rests predominantly on advertising sales. The international pattern of advertising to sales for newspapers in developed countries is 50% to 50%, while Brazilian newspapers generate 68% of their revenue from advertisements. [xxxi] This proves problematic because private advertising is tied to the state, meaning most private businesses rely on the state to stay in operation. So while the state may not directly purchase ads for a newspaper (though they usually do), they could influence a newspaper by instructing a business owner with a pending loan at a state back to reexamine where their advertising dollars are spent. [xxxii] To put it simply, there has never been a “golden age” of press freedom from government influence. Aside from exercising influence via financial power, the government of Brazil has approached censorship from many angles, often shifting gears from implicitly restricting press freedom to implicitly doing so. In 1932, at the beginning Estado Novo Period, the Official Department of Propaganda (later called the Department of Press and Propaganda, or DIP) was created to censor the media. [xxxiii] It was after the department evolved into the DIP that the theoretical guarantees of free speech and free press became both systematic and pervasive. [xxxiv]The DIP implemented a variety of tactics to censor the press, largely because the government, in its desire for legitimacy, denied the existence of censorship. First, the government would use audits to restrict the press, which often happened because it was easily disguised as procedural fiscal review. [xxxv] In reality, the audits merely systemized existing methods of censorship while making the regime’s intentions easier to conceal. There were also times when the government simply confiscated newspapers before they could be distributed. Police would surround the headquarters of newspapers distribution facilities and seize the entire print run. In 1977 alone, The Tribuna da Impresna had its run seized over eight times. [xxxvi] By and large, news was addressed as if it were a controlled substance, not a product of the public domain. The press, for the most part, seldom resisted the government, largely because government intrusion is all Brazil has ever known. There were times, however, when the journalists who weren’t being bribed by the government would try to inform the public of the true nature of the news, and because the government watched the every move of newspapers, editors were forced to get creative. Rogerio Cavalcanti walked into his attack in April 1974, when he witnessed law enforcement officers brutally assaulting a man in the street. Before continuing his walk with his friends, Cavalcanti remarked that the victim was receiving a “real bruising,” to which the police replied, after seeing his documents, “Oh you’re a journalist, are you? Come and get different coverage.”[xliii] At this point they began to beat him. One officer was wounded in Cavalcanti’s effort to escape the blows, and he was charged with assaulting an officer. In December of 2009, seven months after the Press Laws were struck down, an appeal to the Supreme Court by the newspaper O Estado de S. Paolo was dismissed on the grounds of technicalities, when in reality the courts did not want the paper to print legally obtained information about Federal Police investigations involving the corruption of Fernando Sarney and a former president. [xlvii] The case gained national attention when it was discovered that the judge who issued the initial gag order worked as Sarney’s Senate advisor and had a personal relationship with his family. On 15 September, the paper was successful in having the judge removed, but the gag order remained. In 2013, Lucio Pinto was ordered to pay US $200,000 regarding a libel suit. According to the Committee to Protect Journalists, Pinto had written a story in 2005 addressing the influence of a media group on politicians and companies. [xlviii] Pinto, a recipient of the International Press Freedom Award for courageous reporting, claims his constitutional right to expression was violated. Pinto’s previous criminal defamation and libel suits were suspended after the Press Law was struck down. Currently, Brazil is in the international spotlight not for its court cases, but for the unsolved murders of journalists. Journalists Santiago Ilidio Andrade[li], Pedro Palma[lii], Jose Lacerda da Silva[liii], Geolino Lopes[liv], and Rodrigo Neto[lv] have been assassinated since February 2014; each journalist reported on corruption. The violence toward media personnel in Brazil, along with the current interpretation of “free” speech and press in the country stand in stark contrast to other industrialized countries, especially when compared to Supreme Court decisions in the United States. The United States rose 15 spots to number 32 on the 2013 World Press Freedom Index, a jarring 76 places ahead of Brazil, a country with constitutionally protected speech. [lvi] The differences in how free speech is treated between the two countries differ as much in their application as they do numerically on the Press Freedom Index. First, the United States’ media landscape is nothing like that of Brazil’s. While Brazil’s television dubs as a “form of political patronage,”[lvii] television in the United States serves as a platform for politicians and citizens alike to express their political views. Further, smaller publications in Brazil still do not have economic autonomy from the government, causing rural radio and television stations to be partisan. [lviii] More often than not, politicians and churches in these rural areas dominate the media sector. In addition to differences in protected speech with respect to overall media landscape, the United States and Brazil differ greatly in both the application of their respective constitutions regarding free speech, and the constitutions themselves. The latest Brazilian constitution states that for their citizens, “the right of reply is ensured,”[lix] meaning Brazilians have a right to defend themselves or reclaim their honor through the same media outlet in which their character was denounced. Further, Burger pointed out the failure of the petitioner to establish how government regulation could effectively be exercised without violating the first amendment. Burger acknowledged that freedom to publish “means freedom for all, and not for some,” however he made clear that press freedom from government intervention in no way “sanction[s] repression of that freedom by private interests.”[lxi] The judges ruled in favor of the Herald unanimously; a decision that undoubtedly would have turned out differently had it taken place in Brazil, where Tornillo would have had a constitutional right to reply. The Brazilian constitution explicitly prohibits anonymity; which is an issue that, like the right of reply, has been not been addressed in the United States constitution, but has made its way into the Supreme Court. In McIntyre v. Ohio Election Commision (1995) Margaret McIntyre handed out leaflets at a public meeting that were signed “Concerned Parents and Tax Payers,” and was fined $100 for violating a section of an Ohio Elections Commissions code that prohibited the distribution of anonymous campaign literature. The Supreme Court ruled in favor of McIntyre in a 7-2 vote, ruling out anonymity as a cause for unprotected speech. In the majority opinion, Justice Stevens affirms “an author’s decision to remain anonymous, like other decisions concerning omissions or additions to the content of a publication, is an aspect of the freedom of speech.”[lxiii]Though not every justice shared Steven’s views, his argument was strengthened tenfold when he defined anonymity as “a shield from the tyranny of the majority.” When defined this way, one can see why a country that often censors its citizens would include a prohibition against anonymity in their constitution. Unlike the United States, Brazil does not have this prohibition written into the constitution in an effort to “protect unpopular individuals” from harm, or shield their ideas from being suppressed “at the hand of an intolerant society.”[lxiv] It is through its strict laws on anonymity, honor, and defamation that Brazil proves itself to be the very intolerant society of which Stevens spoke. It goes without saying that a fundamental difference in constitutional definitions of the freedom of speech yields different decisions on similar issues. Though Brazil has improved in regard to reducing the number of citizens tortured and the extent to which they are punished for expressing themselves, there is much improvement to be made. It is well known that the United States Supreme Court previously made decisions that restricted expression, such as decisions made when the Smith Act (which penalized anyone who advocated for the overthrow of the US government) was enforced; yet in still the Supreme Court has continuously redeemed itself in its effort to protect individual liberties from government intrusion. Brazil, if nothing else, serves as proof that a piece of paper endorsing free discourse in a society is not sufficient to actually protect freedom of expression. Brazil’s rulings on free speech issues allow for the abuse of liberties by law enforcement, which underline the judicial branch’s obligation to keep the constitution alive, and ultimately serve as an example of what can happen when a state’s interests outweigh the constitutionally protected freedoms of its people. Reporters Without Borders, “World Press Freedom Index,” (2013): 8. Reporters Without Borders, “FOUR JOURNALISTS KILLED SINCE START OF 2014,” (2014). “Censorship—Brazil,” Iberia and the Americas: Culture, Politics, and History (2005): 2. Anthony Pereira, Political (In) Justice, (Pittsburgh, PA: University of Pittsburgh Press, 2005) 44. Anne-Marie Smith, A Forced Agreement: Press Acquiescence to Censorship in Brazil, (Pittsburgh, PA: University of Pittsburgh Press, 1997) 27. Dom Paulo Evaristo Arns, Brasil: Nunca Mais, (Petropolis; 1985) 75. Archdiocese of São Paulo, Torture in Brazil, (Austin, TX: LLIAS Special Publications, University of Texas at Austin, 1998) 152. Archdiocese of São Paulo, 57. Archdiocese of São Paulo, 115. Article 19, “University professor convicted of defamation; his one-year prison sentence reduced to community service,” IEFX (2007). Reporters Without Borders, “Brazilian journalist gets jail term for fictional short story,” IEFX (2013). [xxxvi] Teresa Caldera and James Holston, “Democracy, Law, and Violence: Disjunctions of Brazilian Citizenship,” Fault Lines of Democracy in Post-Transition Latin America (1998): 275. [xxxix] Archdiocese of São Paulo, 67. [xlvi] Carolina Matos, Journalism and Political Democracy in Brazil, (Lanham, MD: Lexington Books: 2008) 241. [xlviii] Committee to Protect Journalists, “Brazilian court orders journalist to pay damages for libel” (2013). [xlix] Instituso Prensa y Sociedad, “Judge orders humour columnist to refrain from writing about actress; police arrest photographer, hinder work of reporters” (2009): IEFX. [lii] Inter-American Press Association, “Newspaper owner killed in Brazil after receiving threats” (2014) IEFX. [liii] Reporters without Borders, “TWO JOURNALISTS GUNNED DOWN IN PAST FOUR DAYS” (2014). [lv] Committee to Protect Journalists, “Rodrigo Neto” (2013). [lvi] Reporters Without Borders, 8. [lix] Brazil Constitution, 1988, Art. 5. [lx] Miami Herald Pub. Co. v. Tornillo, 418 U.S. 241, 94 S.Ct. 2831, Supreme Court of the United States (1974): 2839-2840. [lxiv] McIntyre v. Ohio, 357. [lxv] The Guardian, “Google executive in Brazil detained after failure to remove YouTube video” (2012). [lxvi] Hustler Magazine, Inc. v. Falwell, 485 U.S. 46, Supreme Court of the United States (1988) 879. [lxvii] Near v. State of Minnesota ex rel. Olson, 283 U.S. 697, Supreme Court of the United States (1931): 721.